3 Piece White Bistro sets are another popular choice available in outdoor bistro sets. They are made from different materials like resin wicker, metal, cast aluminum, cast iron or resin. These sets come in many different designs and styles. Some are more traditional with their rose pattern design while others are more modern with their straight lines. Some white bistro sets are also foldable which makes them easy to store when you want to put them away and they are also portable. Sets that are made from a combination of cast aluminum and cast iron offer added stability and extended durability with their hardened powder coated finishes. If you are looking to create a more traditional setting, then the Belleze 3-Piece Bistro Set in white is both charming and traditional to create a certain look and feel. The Belleze 3-Piece Bistro set in white features a charming and traditional rose pattern that is set into the round table and two chairs to blend in with your outdoor ambience. This outdoor bistro patio set would be the perfect bistro set for tea in the garden, patio, deck or even by the poolside. The round table features an aluminum top and an umbrella hole that adds to its elegant design. For added stability and extended durability, the furniture legs are made from cast iron. This outdoor bistro patio set will make a perfect addition to patios where you want to create a traditional setting. Resin is another type of material that is used to make 3-piece white bistro sets. A resin set like the Andover Mills Quebec 3-Piece Bistro Set (White) is a quick-fold cafe set that is ideal for an on-the-go bistro set. This lightweight 3-piece bistro set is made from high quality resin material and includes one rounded-edge square table and two matching chairs that resist UV and rust. This bistro set has a small footprint that allows for seating without taking up too much square footage. This set folds quickly and compactly which makes it great if you are planning a picnic, camping trip or any other outdoor activity. Also, if you are planning a party and you need additional seating, then this set will come in very handy. I should also mention that bistro sets that are made out of resin are very easy to keep clean. All you need to do is wipe them down with a damp cloth. This set also folds easily for storage to save space when not in use. The manufacturer provides a one-year warranty on these products. If you are looking for an outdoor bistro set in white that is lightweight in construction and easy to maintain then the Andover Mills Quebec 3-Piece Bistro Set is an excellent choice. 3-piece white bistro sets are also made out of steel. These sets are rust-resistant with a powder-coated finish to help protect them from the elements if left outside. These sets that are made of metal, are strong and durable and they come in elegant designs. They are also very easy to maintain. 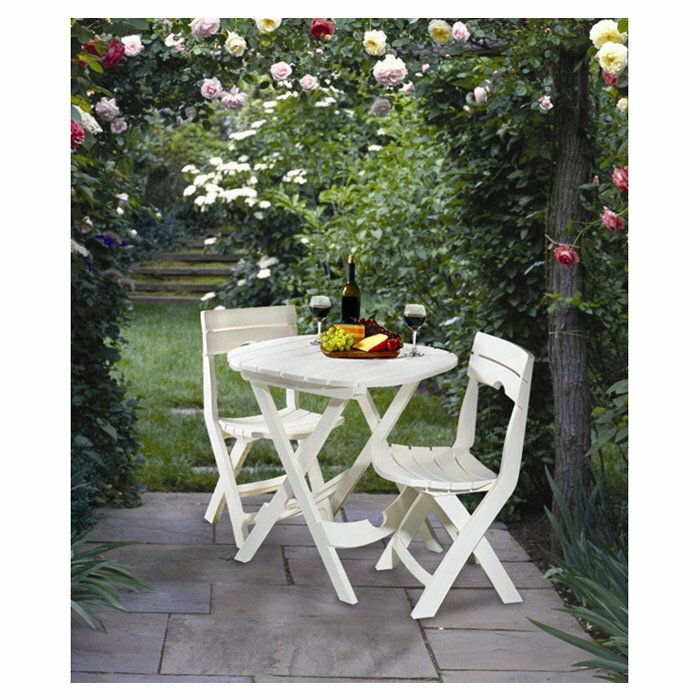 If you are looking for a 3-piece white metal bistro set that is fold-able, then the Finnhomy 3 Piece Outdoor Patio Furniture Sets, Outdoor Bistro Sets, Steel Folding Table and Chair Set, w/Safe Lock for Indoors and Outdoors Bistro Table Chair Sets,Backyard/Bistro/Patio/Lawn in White is one such set that is made out of 100% metal and comes with a folding table and two chairs. If you have limited space, then this set would be PERFECT for a small patio, porch or balcony. Each piece folds easily to allow for easy storage or transport when you need additional seating. This multi-purpose bistro set would go well outdoors or indoors as a bistro set. If you prefer a 3 piece white resin wicker bistro set then the Tortuga Outdoor Biloxi 3 Piece Swivel Patio Bistro Table Set, White with Navy Cushions is a very nice looking set. This resin wicker set is heavy-duty in construction and features two hand woven swivel gliders in all-weather wicker. The matching table woven in the same wicker has a tempered glass top and a shelf. This white bistro set also comes with four indoor/outdoor cushions for added comfort. The resin wicker material that was used to make this set makes it resistant to stains, cracks, water and UV rays. I think the contrast between the white resin wicker and the navy blue cushions makes this bistro set really stand out. No matter which style of white bistro set you choose, you will create an outdoor living space for enjoying a cup of coffee first thing in the morning while you read the newspaper or an afternoon tea on your back patio. These sets will also be ideal for entertaining guests outside and will create an intimate setting for your outdoor living space.. They would also go well on a front or back porch or by the pool area.